MISSING LINKS ! there are no missing links . How can something be missing if it has never been in existence ? Millions of people have been deceived into accepting a smooth easy to follow and marked out progression from a common ancestor to present day humanity . We have all seen the easy to follow pictures in textbooks that show a common ancestral ape going through the change to humans . "When I went to medical school in 1963, human evolution looked like a ladder." he [Bernard Wood] says. 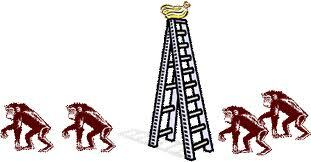 The ladder stepped from monkey to man through a progression of intermediates, each slightly less ape-like than the last. Now human evolution looks like a bush. We have a menagerie of fossil hominids... HOW THEY ARE RELATED TO EACH OTHER AND WHICH , IF ANY OF THEM , ARE HUMAN FOREBEARS IS STILL DEBATED . Whatever the outcome, the skull shows, once and for all, that the old idea of a 'missing link' is bunk... It should now be quite plain that the very idea of the missing link, always shaky, is now completely untenable . The Guardian, 11 July 2002 .